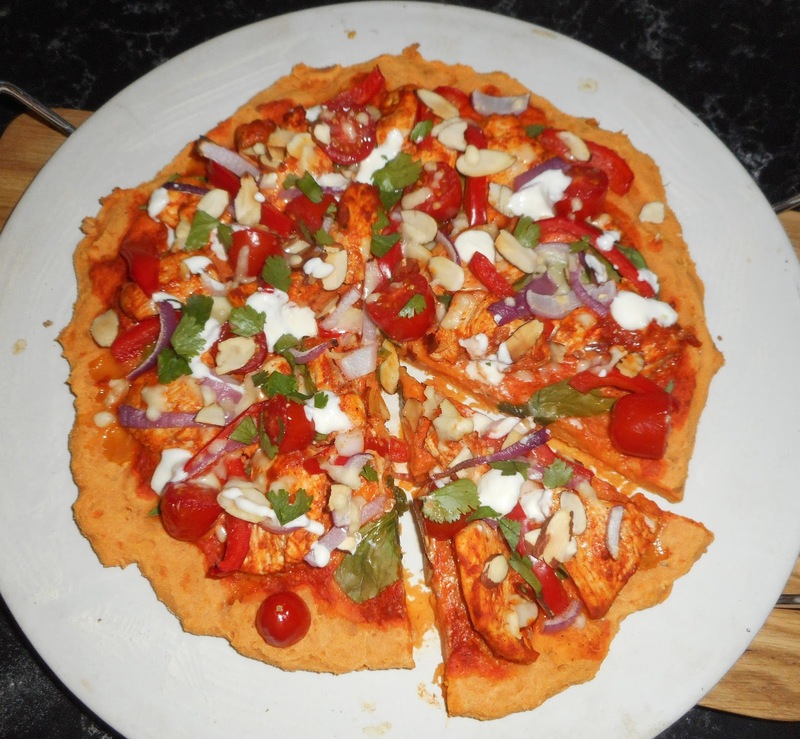 I’ve discovered that tandoori chicken and pizza are a match made in heaven. I’ve made this a few times now and it is always yum. It is a blend of my two favourite foods – curry and pizza…drools. 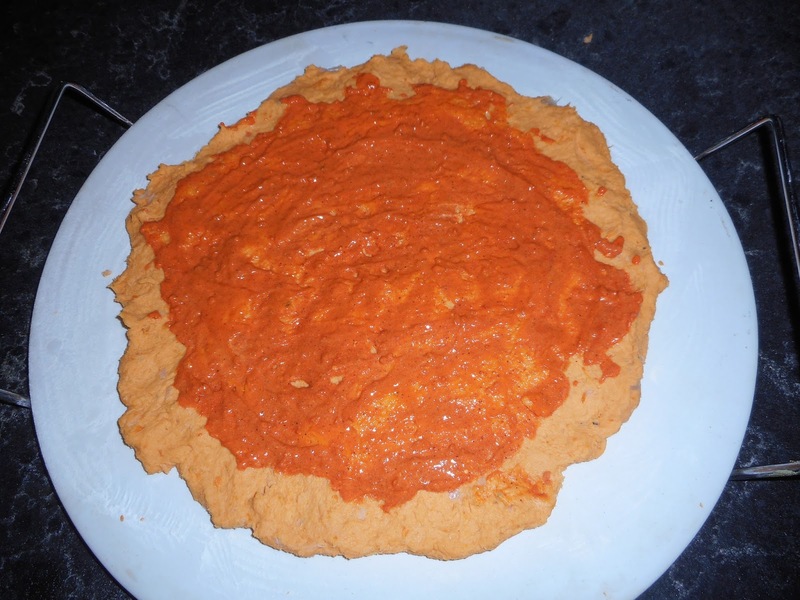 Years ago a friend shared her vegan pizza base recipe with me. I have been tweaking and using it ever since. It makes for a very unique pizza experience. Using this base it totally optional. This is my first time of pairing the toppings with this base. I’ve made this pizza on normal base multiple times. I really wanted to try these flavours together and was very happy with how well they worked together. Any herbs you would like to add (sage, parsley, rosemary, thyme, basil – it depends what toppings you are using). Marinate chicken in 1 tbs tandoori paste and 1 tbs natural yogurt for 30 mins to 1 hr. You can prep everything else while this happens. Preheat the oven to 200 degrees Celcius/392 degrees Farenheit. 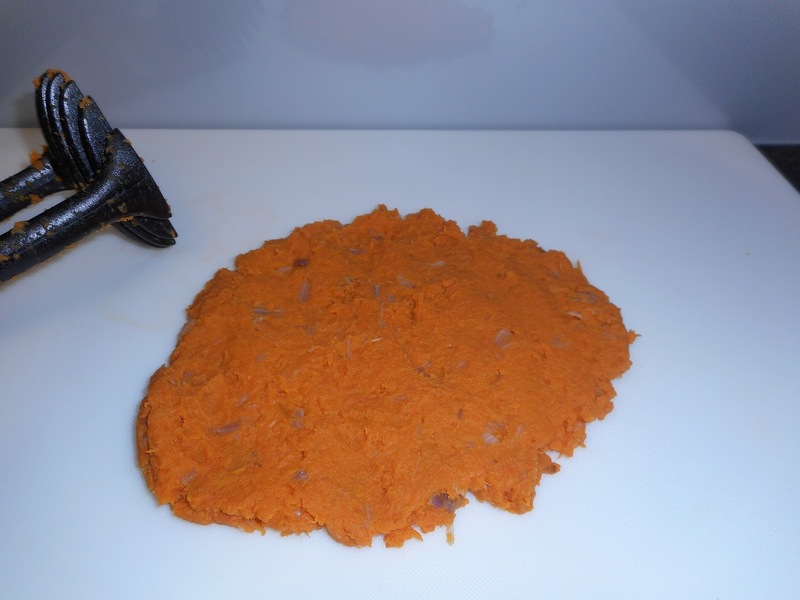 Cook the sweet potato and onion in boiling water until the sweet potato is soft (I know it is weird, but go with me here, it works – I have tried frying the onions first and it makes no difference to the end result, this is just simpler and easier). Drain then mash together, fairly roughly. Mix in some salt and pepper, paprika and any other herbs and spices you wish to use. In this case I used fresh sage from our garden. On a floured board, add progressively more self raising flour until the mix stops sticking to your hands. I have been a naughty blogger and didn’t measure how much I use – it is always a case of just continuing until it is ready. You will know it is ready when it no longer sticks to your fingers. I like to use pre-made self raising flour for this reason, and usually enlist the Dragon’s help so I don’t get my potatoey hands all over the container when adding more flour. Knead and fold it thoroughly. Once it is ready, lightly flour your pizza stone or place some baking paper over whichever pan you usually cook your pizza on to stop it sticking, then spread it into whichever shape you like. Don’t worry about making it perfectly shaped – rustic is best for this base. This is going to stick more than a typical pizza base. Seal the chicken in a hot pan until lightly browned on all sides. It does not need to be cooked through at this stage. then top with chicken, vegetables and cheese (hold off on the extra yogurt, coriander and mango chutney until it is cooked). Bake in your oven for 20 – 25 minutes. Top with fresh coriander, mango chutney and extra yogurt, to taste. While I love mango chutney, the Dragon turns up his snout at the sweetness, so I don’t bother buying it anymore. I highly recommend that you use it with this recipe, however. I think that the toppings work really well with the base, but the base it totally optional. 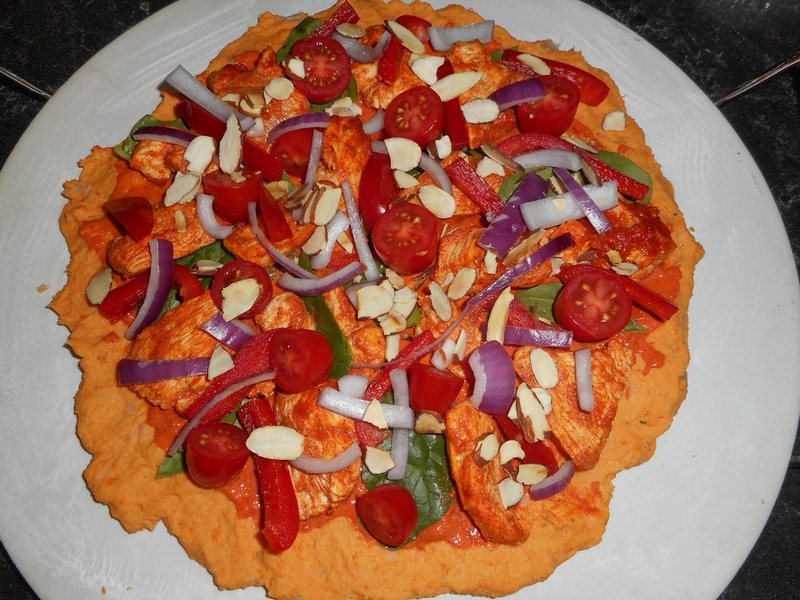 We love using this base from time to time with all sorts of different toppings, and it is a great vegan option if you want to make a totally vegan pizza. I will say, however, that this base is best eaten with a knife and fork (hides from the onslaught of objections). I love this base, and I love tandoori pizza. I won’t always pair them together, but I do like the combo. If you are shorter on time, then a store bought base will do the trick absolutely fine.